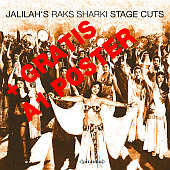 Jalilah´s Raks Sharki - "Stage Cuts"
The best of the pioneering Jalilah's Raks Sharki oriental dance series in 16 stage cuts for a new generation of dancers and performance spaces, selected by Jalilah herself. Traditional songs edited and remastered - are presented in 16 crunchy shortened tracks, selected from six previous albums. A current development shows that Stage Cuts has its finger on the pulse of the times - the facts speak for themselves: In earlier times the typical length for a dance performance on festivals was between 10 to 20 minutes - nowadays the time limit is usually under five minutes. Taken from Mokhtar Al-Said's "El Ferqa Al Mesaya" Orchestra, to Hossam Shaker and his Ensemble, to the magical melodies and rhythms of Ihsan Al Mounizer, this record fulfills the highest artistic demands, mirroring Jalilah's attachment to her idols: "Stage Cuts is a tribute to the great names in Oriental Dance history - to all these musicians, composers and most of all to the per formers who love and cherish this beautiful dance form! ", so Jalilah states her intention for the new release. But also lovers of Oriental Dance music will find what their hearts desire, bridging tradition and modernity.